Drawing Request 03: Wooly mammoth paratroopers REVISED! Soooooo....there where comments on the previous drawing that I didn't fulfill the brief because they didn't look like paratroopers because of the lack of parachutes. So here is another version, with parachutes this time. All done in Flash and I started work on this with 3 glasses of red wine in my system at 9:00 pm and didnt finish till 4 AM. So I now have 7 requests left to go! Yay....oh god.... for those that dont know what's happening or what these requests are, please have a read on this previous post. I am currently animating for a game and working on creating illustrations for online exams for a University. I am also waiting for work to start and looking for other gigs in the meantime. Whatever spare time I have left between drawing and work is dedicated to going to the gym. Every part of my body hurts currently, with the exception of my face. Was wondering if I could enter this for Illustration Friday's safari.....though I suspect that it might be a bit of a stretch....but what they hey! sure this could be safari.... Your a champion to do this in 7 hours with wine in your system, I would fall asleep. Great Work, Love the colours and the grass is amazing. 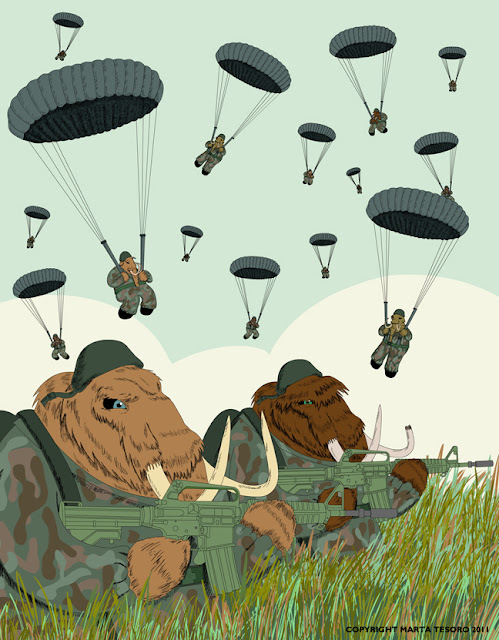 wow, there is a mammoth war going on! How freakin' AWESOME!!! This is wonderful. Thanks so much for your kind words and support. I really appreciate you stopping by. HA! Can't believe you redid this. I must admit, though, seeing mammoths floating down on a breeze is mind bogglingly cool! And you did this while running on alcohol fumes? You wow me! I think this would be a fantastic addition to the Jungle Cruise at Disneyland, don't you?? ?